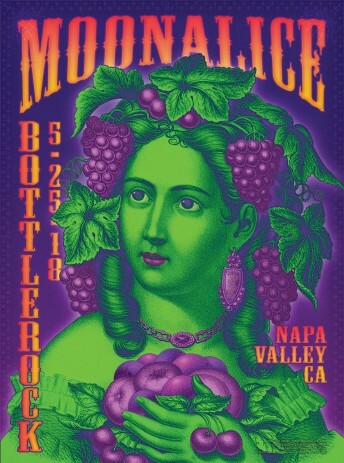 According to Moonalice legend, the grapes of Napa make for fine music. Tonight’s poster by Alexandra Fischer depicts Elphaba Prince Moonalice, the artist formerly known as Pinot Noir. Elphaba embodies the spirit of Napa, combining great music with tribal agriculture. Her award winning extracts power the stages, as well as the silent disco. She wants to thank all of you for supporting live music in Napa. Notes: Jason Crosby on keys, George Porter Jr. on bass.